Hi everyone. It’s been a while since I last posted. I’ve been caught up in other projects that I’m currently developing – can’t wait to share with the comunity! But, recently I’ve focused back on the UI tools of the Data-Shapes package. The community’s reception of Data Shapes UI tools has been overwhelmingly positive, and it has been a true delight to see people getting creative with them and coming up with uses that I never though of. Due to several great suggestions made by some of the users in the community (I’m looking at you Daniel Hurtubise), and a little of my own inspiration, I have made some additions and adjustments to the tool. This post is their introduction. It can open all types of files. Here’s an example with a pdf. RadioButtons are what you need if you want the user to select one of many choices. It will display the list in a box and only one selection will be permitted. The way to set the input up is similar to DropDown or ListView inputs : you must feed a list of keys and the matching list of values. The user will be shown the keys, and the form will return the associated value . Image input :You can now add an image to the form! The input creation is very straightforward. Just feed it a file path and an image title (optional) and add it to the inputlist you give to the form. This input doesn’t return any value to the output list, like with the TextNote input. This input can be useful to give further indication/illustration of what the user is supposed to do. You can use all types of image formats, and even show animated gifs ! Outstanding as usual Mostafa! lots of fun for the weekends ! Great to see the new update. I really like radio buttons. What I did to do a select all is making a toggle with the text select all and than using an IF function. With the new function it will be probably much easier. Thanks a lot! I want to say thanks for your hard work again, and to ask you about an issue that I had. I’ve been experiencing slowness and slow-search in Dynamo after running the UI nodes (previous versions too), and the only way for me to solve this is to reboot Revit and Dynamo. Have you experienced this on your end at all? And do you know what may be causing this? I haven’t experienced slowness using the UI forms. Do you get the issue while working in manual mode? and does it get slow at the moment you place UI.MultipleInputForm++ on your graph ? Just want to post an update that the problem was in fact due to the vdi connection in my office. Your node is working perfectly fine on a local computer! Do you have access to another machine with Revit/Dynamo to make sure the issue isn’t linked to your computer? Why does UI.MultipleInputForm++ output @ “user inputs” “Function” … It used to be a list? Could you upload a picture ? I’d be happy to take a look at it. But I think it had to do due the update to your latest version? I create a same form++ with the same inputs etc. … and voilà it works again . Yes that actually makes sens. I didn’t change any of the input nodes to avoid that but I guess it wasn’t sufficient. Glad to know it’s working again! +1 for that request. I’ve been testing and forget 8 out of 10 times. I can only imagine my users doing this 10 out of 10 times. I hope this will prevent crashig Revit! Please let me know how it works for you. Another thought… a default selection for drop down lists…. for everything for that matter. You are killing it with this. I wanted to use UI to check the warnings in my model. I find a way to isolate in 3D view elements displayed in warnings but what I really like to get is a node witch allow me to switch beetween warning so beetween group of element (like a Next and Previous button). Have a good one too ! Hello! Great work here, i didn´t knew this website but it’s fantastic and helped me just now in my work. I’m a portuguese civil engineer student and i´m working on a BIM system that could give advantage information for quality control in situ. I need to export shared parameters information of doors and windows (for now) but it seems that i can only add one category to be analysed… is there any way or node that select all elements of multiple categories? by the way i’m a bit fresh about dynamo but i’m really enjoying discover new things, i’m learning by seeing tutorials and experimenting things that i see on websites or forums. Thank you for your time. Thanks for you message . 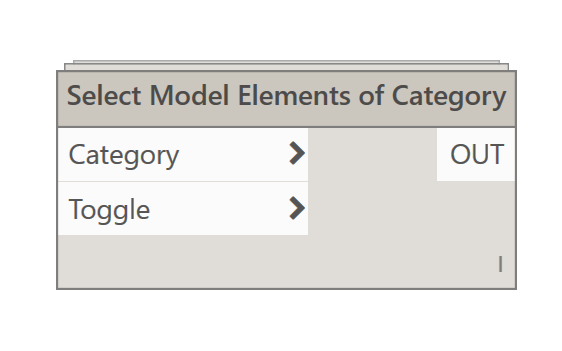 You mean select elements of all categories though the form ? I think you should open a thread on the dynamo forum. It will be easier to provide help there. I would like to ask you if there is a way to arrange the forms on multiple columns to see more of them at once. displaying many forms at the same time is not possible at the moment. But there are ways to open forms in a sequence or to make a form scrollable. You should start a thread on the dynamo forum where you describe your usage case more specifically. It’ll help me provide better help. This is a great tool set. I’m curious if there is a way to eliminate the need to hit the button. This would be specifically helpful for use of the radio buttons where after one (or one of each group) has been selected, it can automatically complete. Please forgive me if you have already addressed this somewhere. thanks for you comment and sorry for the late reply. What you describe could be done but I believe that it would probably be dangerous to not have a validation button. Do you have a specific use case where the validation button is a nuisance? th new UI.Multi++ can not handle ColorInput’s anymore. Local variable “importcolorslection” referenced before assignment. thanks for reporting this! I just fixed it in version 2017.06.19 of the package. Please let me know if it solves the issue for you . I’d also like to point out the fact that this input only works with revit 2017 or more recent. It’s a very good work here. Thanks a lot for the nodes. A small bug: when run UISelectModelElemements Data node, click on button to open the selector mode, then we should select and validate the selection. A very good think. But if we don’t select anything, only open the selection mode, and click Cancel the Revit give and error. I’m not sure if only on my configuration receive an error or is a general one. Some time is needed to cancel the selection mode to temporary isolate or hide elements in view to me more easy the selection making. 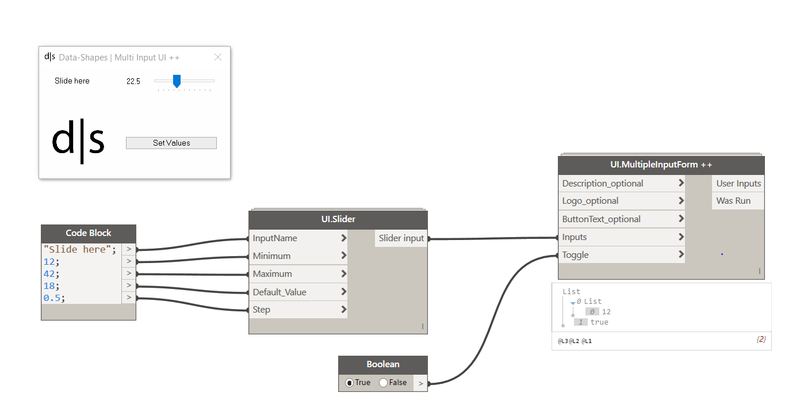 I’m wandering if the cancel (from Revit, not from dialog windows) button have a connection with the script or not. If you need the error details, let me know. This is a great resource, and a very functional node package. Many thanks for your hard work. Thanks a lot! This package is amazing! I really like what this does for the user experience! Great work…. Yes this can absolutely be done. If you want more specific help with a workflow you should start a thread on the dynamo Forum ! Hi, great work first of all, I love your Package! Just a comment about the UI.SelectModelElementsData node – it would be great if it could keep the order in which the elements were selected, instead of re-arranging it. It could be so useful when wanting to re-number things like rooms, doors, etc. Okay you can update the package now 🙂 The new input type is names “UI.SelectModelELements data (ordered)” . Let me know how it goes! Amazing – Worked perfectly, thanks so much! i’m lost and not sure if this is the correct location for this inquiry. i’m looking for a workflow to export electrical panel schedules from revit 2017 to a xls file. this is a workaround because autodesk has not overcome the limitation or allowing panel load data to transfer between linked electrical models on a campus site. 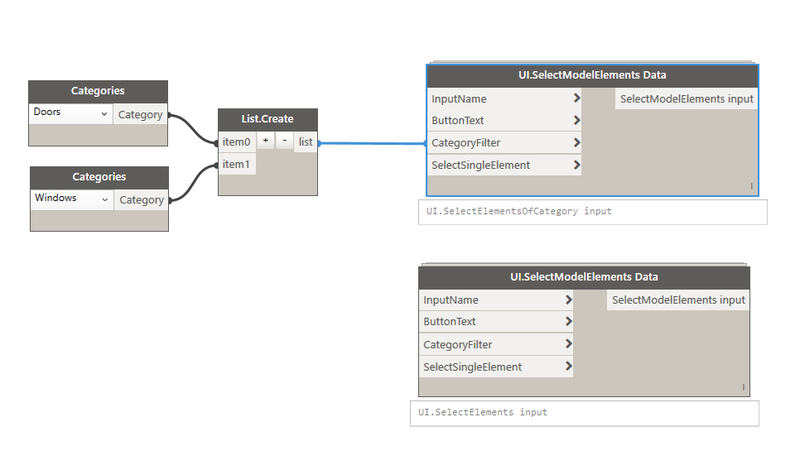 currently i’m using dynamo ExportPanelSchedulesToExcel.dyn but getting (3) “Custom node definition is not loaded!” errors.